Hi friends! Oh my, was I an absent blogger last week. I'm still trying to find a routine with school back in session. We had a busy week at the farm resulting in a lovely wedding on Saturday. I managed to piece the next row of Lori's row along over the course of a few days. I love this row. I have a feeling I am going to say that about every row. This one is darling butterflies. If I was a real photographer I could find a better way to photograph a long stretch of fabric. But since I'm not, here it is hanging from a floor lamp! The butterfly block was a good remember that patience and faith in the Lord will produce beauty in His timing. I love these butterflies; they would be so perfect for a little girl or young lady. Have a wonderful day. Sweet and pleasantly "old fashioned". Thoughts of Springtime and Summer Days...must wait until next year! Your butterflies are so sweet - and I love that you've draped them over the lamp. Very ingenious! I've still got another 10 to sew, but am loving rowing along with everyone. That is a lovely row of butterflies! Aw Renee. Your butterflies are so pretty!! What a sweet quilt this will be. Isn't it fun not knowing what comes next? The suspense makes it so exciting! Hi Renee..you have chosen gorgeous fabrics for your row of beautiful butterflies! Your butterfly row is beautiful! You are just so speedy...I just finished row 1. I have the squares cut for the butterflies, but have some other things to finish before I start row 2. I just hope to be ready for row 3 by next week. Wish me luck! 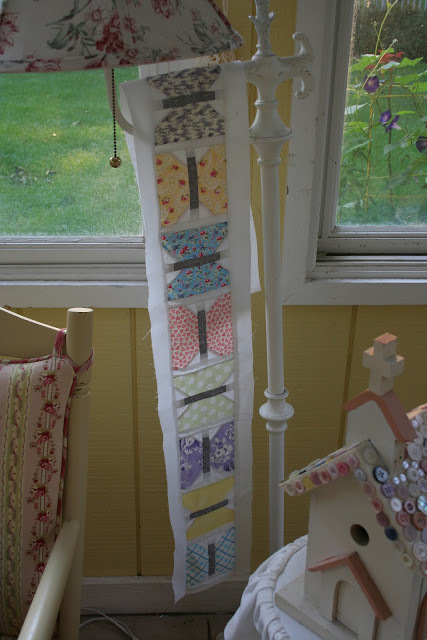 Now I really want to do this quilt. I looove butterflies and I think that is a great way to photograph them.